Both Goliath and Jefthas worked for Agribusiness in Sustainable Natural African Plant Products (ASNAPP) – an NGO – prior to starting De Fynne, where Goliath assisted in the propagation and setting up of plant producing nurseries in African markets, such as Zambia and Ghana. Today they are experiencing ever entrepreneur’s dream: their business cannot keep up with the demand for fynbos, and they are expanding constantly. De Fynne supplies its products to retailers such as Woolworths, Massmart and Spar who in turn sell the plants to consumers for their personal gardens or display in their homes. They have also recently started contract growing for the commercial agricultural sector. 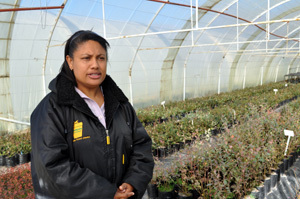 De Fynne’s growth has not gone unrecognised and Goliath received the title of Female Entrepreneur for 2011 – both provincially and nationally – by the Department of Agriculture, Forestry and Fisheries in South Africa. She also received the award for African Agribusiness Entrepreneur for 2012 by Markets Matter Inc.
She added that the next step is to do your costing, and figure out if you can sell a product at the price that the market wants it for. Goliath advises entrepreneurs to start small, and to grow organically. One of the major reasons for this is that if an entrepreneur makes a mistake when the business is still small, the losses might not be as crippling as it would have been if the business had taken on a massive loan to support a huge venture that then fails. According to Goliath, making sure that you offer value for money is one of the ways to stand out from your competitors, but she says it’s more about showing clients that you have honest business principles. Goliath, like most entrepreneurs, cited ‘passion’ as being an important driver for business success. However, she stressed that one also should have a focus on making profits.